I have no reason to think that I'm being observed. But if my neighbors ever watched me mow the lawn, they'd see something strange: I'm always pausing to look up. And quite often they'd see me stop the mower and jog up to the top of my driveway—to grab my binoculars. 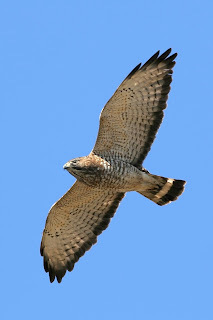 My habit is especially pronounced in the fall, when the sky holds migrating hawks, falcons, eagles and sandhill cranes. Sunny days with cumulus clouds usually offer the best viewing, all the way to Thanksgiving. Hawkwatching occupies a special niche in the birding world, and those who devote themselves to it are a special breed. They live for this time of year, spending hours upon hours on the tops of hills or other open spaces, waiting and watching for raptors. Those can be mighty cold places, too. As the founder and coordinator for the Illinois Beach State Park (IBSP) Hawk Watch in Zion, Berardi is one of our region's foremost hawkwatchers. The IBSP site is now in its ninth season of full-time hawk migration monitoring. In favorable conditions, when westerly winds prevail, the volume and variety of migrating hawks and other birds of prey can be astounding. One magical day, in 2003, some 3,500 broad-winged hawks were counted at IBSP. Other common flyovers are red-tailed hawks, sharp-shinned hawks, Cooper's hawks and turkey vultures. Peregrine falcons, kestrels, merlins, bald eagles and northern harriers are usually seen too. In DuPage County, the best place to go hawkwatching is the hill at Greene Valley Forest Preserve in Woodridge—the highest point around. 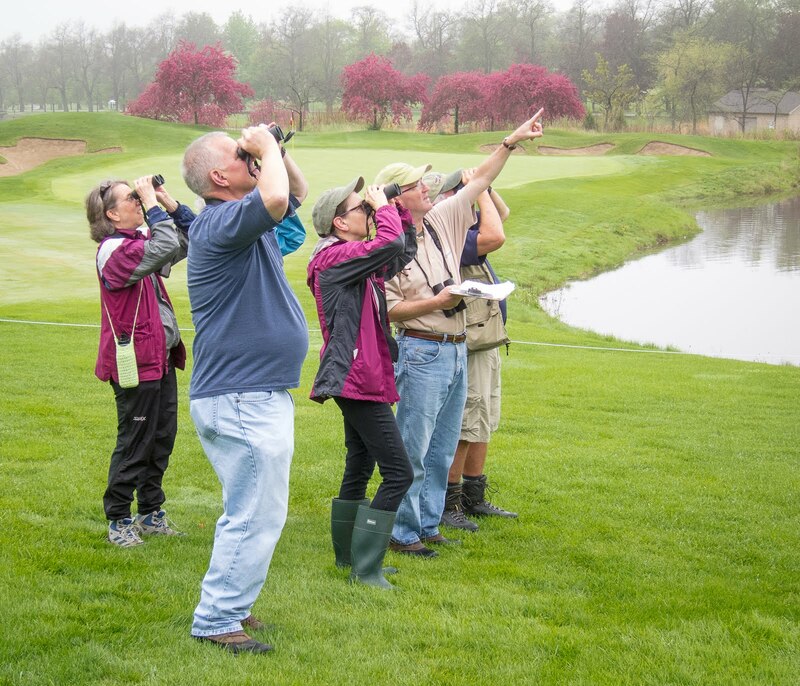 Organized hawkwatching at Greene Valley began in 2006, initiated by the DuPage Birding Club. The folks who turn out at IBSP and Greene Valley are hardy souls—and dedicated volunteers as well. By counting the birds, they contribute to a database that monitors North American raptor populations. This is “citizen science” at its best, conducted in the name of bird conservation. So it's serious work at the hawk watch sites, but also a labor of love. Veteran hawkwatchers long for big days, when up to 15 different species of raptors can be observed. These include rarities such as northern goshawk, rough-legged hawk and our two eagles, bald and golden. In fact, six golden eagles were seen at the Greene Valley site in 2006, and three in 2007. And just a few weeks ago, on Sept. 20, a Swainson's hawk passed over IBSP—the fifth one in the last three years. Another highlight of the hawkwatching season is the swirling flocks or “kettles” of broad-winged hawks. With patience, you can witness this fall phenomenon from your own backyard. The birds will likely be very high, appearing almost as specks. But with good binoculars you can see their distinctive black and white tail bands. The challenge of identification is certainly part of hawkwatching's appeal. After all, most raptors are seldom seen perched—they must be identified when in flight. Keen ID skills are especially important during fall migration, and they are generally earned through countless hours of field observation. Experts can spot a flying raptor at great distances and know the species without the benefit of seeing specific markings or colors. Instead, they use clues such as size, overall shape and how the wings are held when the bird is soaring. Luckily, there are some great books on the subject to assist novices like me. Berardi recommends two in particular: “Hawks in Flight,” the classic by Pete Dunne, David Sibley and Clay Sutton, and “Hawks From Every Angle,” by Jerry Liguori. Regular field guides are useful too—especially those that illustrate birds of prey as they appear from below, when flying over. The Peterson and Sibley guides do this quite well. This month, try to get outside as often as possible and scan the skies. Even when you're cutting the grass or raking leaves. After all, some chores are just birding opportunities in disguise.